If you’re like most people, you probably started the New Year with some goals in mind. But did you set intentions as well? Goals are all about future outcome, whereas intentions are all about present authentic desire. Left-brained people usually prefer goal setting because they can take a practical approach by analyzing their current situation, their abilities, their environment and the time they have to reach their goal so they can develop their action plan. Setting intentions often seems counterproductive and a little airy fairy to left-brained folks, which is understandable. Intention involves some degree of surrender and trust that the universe will bring them what they truly want, and those whose minds constantly obsess over searching for certainty and maintaining control may have a really hard time embracing this idea. If you’ve struggled in the past with reaching goals, consider shifting your focus a little more toward intention and a little further away from your goals. Ideally, intentions and goals should be used together, striking a balance between the two in whichever way will optimize your chances for success. Not yet convinced intentions matter so much? Here are a few key points to bring into your awareness on the art and science of balancing your goal setting with intention setting. Intentions are about taking action for the sake of curiosity, whereas goals are about taking action for the sake of control. When people set goals, their action plans tend to include steps that are logical, measurable and realistically achievable. That’s all fine and good, but what happens when something unexpected happens? They usually get frustrated that they’re no longer in control. Setting intentions along with your goals puts you in a more open state to the reality of uncertainty. Instead of freaking out about what you need to regain control of, you can become curious about what’s happening (even if you don’t like it) and flow along with it. Intentions keep you connected to the present moment, whereas goals keep you focused on the future. Being a little too fixated on goals may lead you to spend a little too much time fantasizing about eventually reaching them in some far off, future dimension. This can quickly become a problem if it prevents you from getting out of your head and back to reality. Intentions put you deeply in touch with what you’re feeling right now. They keep you grounded in the present rather than stuck trying to do what you think you need to do based on the imaginary scenario playing on repeat in your head of what you want the future to look like. Intentions help you build habits, whereas goals help you build vision. There are a lot of good things about goal setting, and one of those things is how it encourages you to visualize your ideal future. The only problem with it, as stated in the last point, is that you can often get stuck there in fantasy land. Since intentions keep you connected to where you are and what’s going on right now, you’ll feel more naturally in tune with yourself and your surroundings, which is helpful for determining what you need to be doing right this very moment — no matter what the future might hold. This is actually the secret to forming habits that stick. Intentions are unbound by time, whereas goals tend to be fixed in time. When you set a goal to be achieved by certain date or date range, you’re essentially trying to predict an unpredictable future. Things that you wanted to avoid or couldn’t have predicted might actually happen, thus making you more anxious and doubtful about being able to achieve your goal in time. You can set a date for your goal, but don’t get attached to it. Your intentions will help you accept what’s happening in the moment and readjust accordingly so that you can achieve your goal in the time that you really need. Intentions motivate you by learning, whereas goals motivate you by outcome. 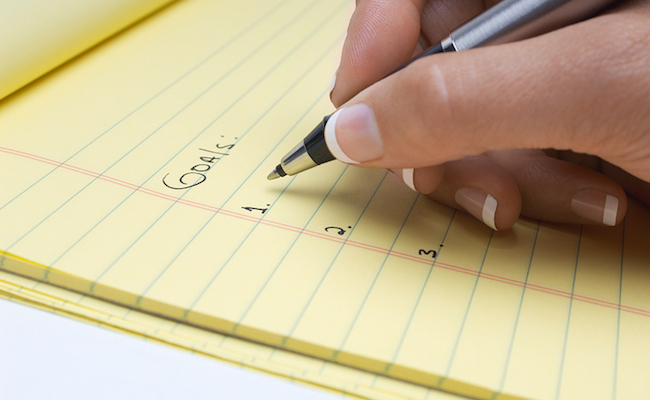 When it comes to goal setting, you’re probably looking for results. There’s nothing wrong with wanting results, unless that’s all you can think about and that’s all that’s motivating you. Intentions exist to serve your continuous, never-ending growth. When you have good intentions, failure ceases to exist as an option because intentional individuals see everything — even the most difficult challenges — as opportunities to learn and grow instead. Whatever your goals may be, make sure you take the time to sit down and take a few moments to identify the intention (or intentions) behind them. All you need to do is become aware of them and remain aware of them as much as you can. Unbelievable as it might seem, life will quite literally take care of the rest as long as you keep those intentions with you. Might just explain why all (or most) of the peacemakers have been replaced by peacekeepers. Just another imbalance of this sad current world we share.